Unfortunately I have a food sensitivity to bi-valves (scallops, mussels, clams and oysters) so I wasn’t able to eat this but it sure smelled amazing. It broke my heart a little, but I made sure that there were people around who would be my official taste testers so nothing would go to waste. 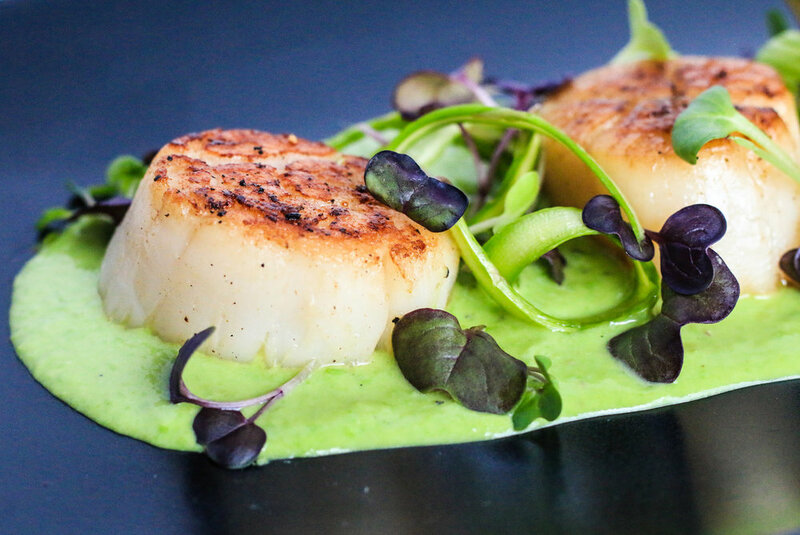 I know there are a lot of scallop lovers out there so you will have to tell me how this recipe turns out if you give it a try! Bring a medium sized pot of salted water to a boil. Blanch the peas for 3 minutes, drain and transfer to a small blender or food processor. Add in cream or melted butter, garlic powder and salt and pepper. Puree until smooth. Pass the pea mixture through a fine mesh sieve, pressing the mixture through with a rubber spatula so that the puree is extra smooth. Cool the pea puree immediately to ensure it keeps its bright green colour. In a small bowl toss together asparagus ribbons, lemon juice, a dash of olive oil and salt and pepper to taste. Set aside. Pat the scallops down with paper towel and season them with salt and pepper. Heat the oil in a large sauté pan over medium high heat. Make sure the pan is nice and hot before you add the scallops – you want to hear a sizzle as it hits the pan! Make sure the pan is not over-crowded - there should be an inch of space in-between each scallop. You might have to cook them in two batches. Add the scallops to the pan and cook for 2-3 minutes per side, flipping only once. It is important that you do not touch the scallops while they cook to ensure you get that nice brown crust on them. If the scallops do not easily release from the pan they are probably not ready to flip yet. To serve, spoon the pea puree onto a plate. 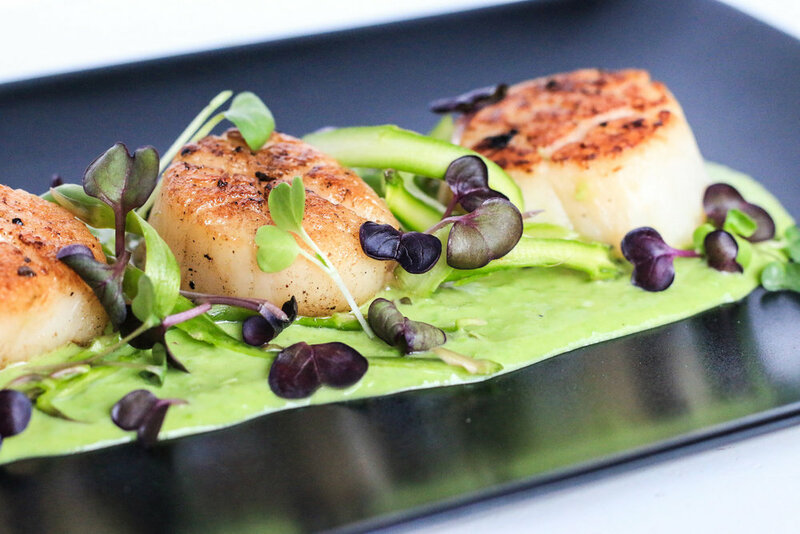 Place the seared scallops directly on top, and garnish with asparagus ribbons and micro greens.